Camphor glass is clear glass that has been treated with hydrofluoric acid vapors to give it a frosted, whitish appearance. This effect resembles gum camphor, hence the name. Camphor glass was used throughout the decorative arts to make bottles, glass objects, lamp shades and more. In jewelry, the glass was often cast with a star pattern on the reverse to give it a radiant appearance. Camphor glass was made to imitate the carved rock crystal quartz that was popular from the mid-nineteenth century through the 1930’s. A revival of the look in a faux Art Deco style became very popular again in the late twentieth century. 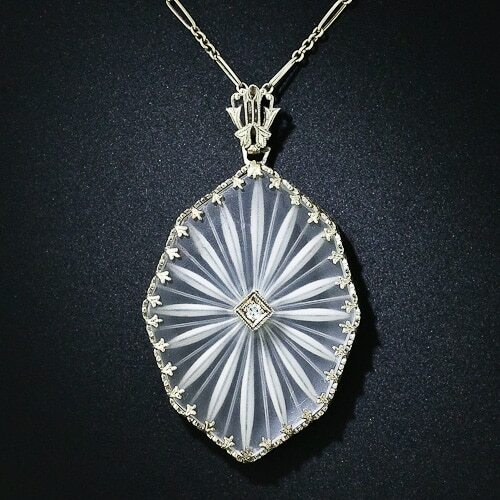 Art Deco Camphor Glass Pendant.